The VM Challenge, a one-of-a-kind window display competition, held at In-Store Asia 2016 at Pragati Maidan, New Delhi was won by Team Emerald led by Siddhant Sahu, while Team Sapphire led by Kapil Yadav bagged the runners up award. Amidst the glamour of the In-Store Asia 2016 expo and the hunt of visitors for new and innovative products, the VM Challenge drew the audience to witness a live window display contest- a1 hour tiff where we saw visual merchandisers draw up window displays on the spot. 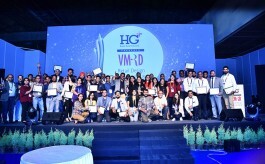 Anchored by Balaji Natarajan, Creative Head - Visual Merchandising, Graphic and Store design, Titan Company, the participants were challenged to showcase their VM talents spontaneously and with limited resources. Just before the challenge started, the 6 teams were announced and briefed on the theme. 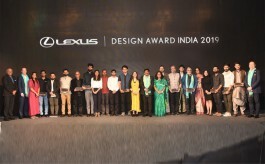 Team leaders included Kapil Yadav, Louis Philippe; Akash Kumar, Lifestyle; Deepak Chakravarty, adidas; Kaushik Sheel, Shoppers Stop; Siddhant Sahu, Few Steps Ahead and Abhishek Lewis, Future Group. 'Looking at the world in a crystal clear way' was the essential gist of it with sunglasses and spectacles being the product to be showcased. With just one hour on hand, we saw the teams battling with time and 15 minutes into the competition, they're given an additional task! They had to draw a connection to the upcoming Rio De Janerio Olympics. With the heat rising, while people gathered around to watch this nail-biter. 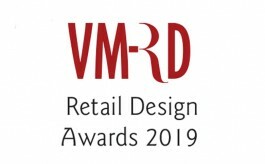 The winners were awarded during the VM&RD Retail Design Awards held later in th evening.